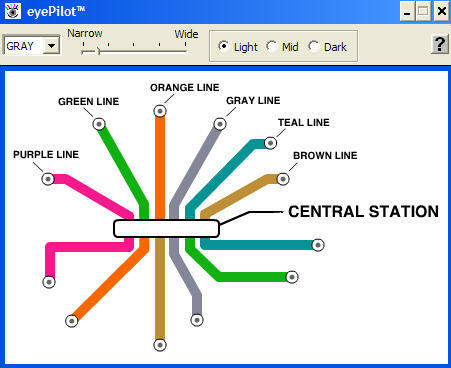 eyePilot Color Guide is an interactive software for computer-savvy people who are color-blind or suffer from any form of color-deficiency. With eyePilot, Colorblind people will get a better view of color-dependent web sites, documents, graphics and computer applications. The program works by placing an interactive floating window (Capture Window) like a layer over any web or browser window on your computer screen. EyePilot lets users pinpoint particular shades on a screen or shift hues to bring out easier-to-detect contrasts. Move the PC's cursor over an item, and eyePilot reports what the color is. If the user clicks on a color name, all instances of it on the page will flash. Or one color can be made to stand out by converting the rest of a page to gray and white. eyePilot tools are even useful if you analyze lot data represented with color like historic stock prices, weather maps, geographic terrains or other financial data.